Tranquil Kurrimine Beach, midway between the bustling, highly developed cities of Townsville and Cairns, and close to Mission Beach, has become one of North Queensland’s most closely guarded secret. Kurrimine Beach is part of the Canecutter Way, the greatest detour in North Queensland. Kurrimine Beach is famous for having the best fishing in North Queensland and is home of the renowned King Reef Crayfish. 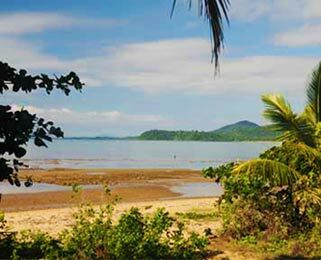 The beach at Kurrimine is a lovely palm fringed quiet and safe beach with great views to Dunk Island and the South Barnard islands. The walk from the boat ramp to the mouth of Maria Creek will take about one hour. The Kurrimine Beach Holiday Park is a mere 70 metres from this beautiful unspoiled beach . On the lowest of the low tides, usually occuring for a few days each month from May to September at the new moon, walk out to King Reef and bag yourself a famed painted Cray or just enjoy exploring the reef. Surrounded by lavish tropical flora, blue seas, golden sands and the wondrous Great Barrier Reef, Kurrimine Beach is a different world. King Reef is the closest spot where the Great Barrier Reef comes to the Queensland Coast. This and other close by reefs make Kurrimine Beach a great fishing spot, not to mention the famous painted crays that can be picked up from the reef itself. Kurrimine Beach has a stinger net, a tidal boat ramp out from the beach and an all tides concrete boat ramp in Maria Creek, which is only a 10 minute boat trip from the ocean.